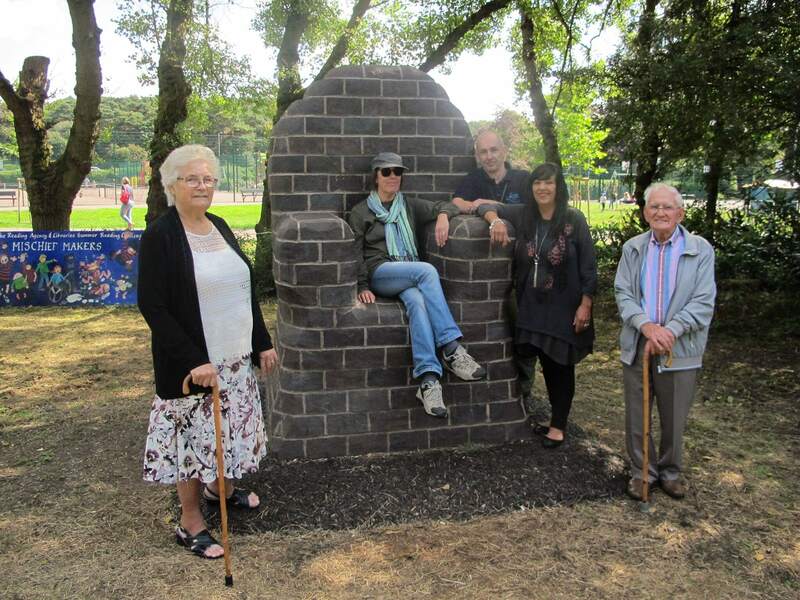 A brick chair sculpture has been unveiled in Hednesford Park, nearly 20 years after it was originally donated to Cannock Chase Council. The chair will be a significant addition to the story walk events and activities held in the park lead by the Community and Education team throughout the year and will encourage local schools to use it to promote story telling sessions as part of the school curriculum. The sculpture was made by Rosemary Cripps in 1999 whilst she was studying for a degree in Ceramics and Sculpture at Wolverhampton University. Rosemary’s idea was to create a large sculpture for displaying in a public space that could be used by all ages. The chair was made from large raw clay bricks, which were carved into the chair design. Rosemary then had to dismantle the chair piece by piece, hollowing out each brick so that they would not fracture in the high-temperature kiln, then mark them with a unique code and drawing plan, so it could be reassembled once it had been fired. The project was sponsored by Ibstocks Bricks of Aldridge in Walsall, who fired the clay bricks in their kiln and transported them to Cannock Chase Council for storage. Earlier this summer a special foundation was prepared and the sculpture was built using Rosemary’s numbering system and detailed plan in Hednesford Park. The chair unveiling in conjunction with the libraries ‘Mischief Makers Summer Reading Challenge’ where children had to complete reading 6 books of their choice during the 6 week holidays. The event included a ‘pie face challenge’ for those who had completed the challenge along with fun craft activities in the library and storytelling of mischief stories in Rosemary’s chair.